– Test #HYPOXI for free now! Get inspired by HYPOXI customers and achieve a completely new body sensation through our targeted method. “With a maximum weight of 73 kilos, I knew – now it’s time – that was definitely too much for me! I’ve had it in mind for quite a while, however the realization just wouldn’t work (I didn’t want to go on a diet). 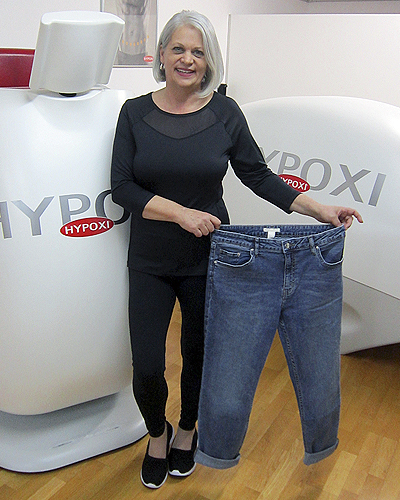 Friends told me about a HYPOXI-Studio and its good results. Within one week I started my training together with a change in nutrition at Silvia’s HYPOXI-Studio in Dornbirn (Austria). From day one I was delighted and didn’t have any difficulties with the training nor the nutrition change, I simply had fun. After three months, I had reached my desired weight of 59 kilos. Since then I have been feeling much healthier, more active, happier and I have fun again buying clothes.